Novotel ExCel is located alongside the Royal Victoria Dock, 150 meters from the ExCel Centre. The hotel is close to London City Airport and shares the same building as the Ibis ExCel. Within a few minutes by road from Docklands/Canary Wharf this area gives access to east London as well as into the City of London itself via the dual carriageway that runs right through the Docklands towards Tower Bridge (Aspen Way, a1261). 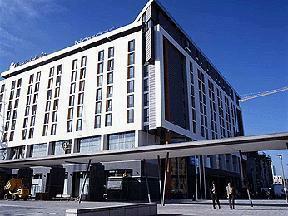 Built at the end of 2003 this a new generation Novotel offering 257 new Novotel rooms. Perfect for anyone also visiting the ExCel exhibition centre as the hotel faces the West entrance and is just a 100 yards walk across a pedestrian courtyard. The hotel features a spacious restaurant, a bar overlooking Royal Victoria Dock, a fitness room, 12 meeting rooms with a capacity for up to 70 and on site parking. Additionally the Novotel hotel offers a fitness room (with sauna and steam room) and facilities for disabled people. Within a few minutes by road from Docklands/Canary Wharf, this area gives access to east London as well as into the City of London itself via the dual carriageway that runs right through the Docklands towards Tower Bridge (Aspen Way, A1261). Payable parking is available at a nearby multi-storey car park. By Tube: Take the Jubilee line to Canning Town and change onto the Docklands Light Railway towards Beckton, alight at Royal Victoria. Journey time from Canning Town is 8 minutes. By Road: A new road network links Novotel Excel directly to the North Circular (A406), the M11 and M25. By Air: City Airport is only 5 minutes away from the hotel. Stansted to Liverpool Street is 35 minutes.